EMBA Cohort 15 alum Stephen Packard. The corporate culture of a privately-held Fortune 500 engineering and construction company is literally changing because of the influence of Stephen Packard, UNLV EMBA cohort 15 alum. Packard is a vice president/area manager for the Kansas City-based Kiewit Power Constructors Co. He received the promotion following graduation from the UNLV EMBA program. Working from the company’s Kansas City office and overseeing projects in Detroit, Memphis and Nashville, Packard is responsible for regulated utility clients in generation markets and projects ranging in size from $200M to $800M with annual revenues of $300M. In addition, he manages the company’s Engineering, Procurement and Construction Implementation group as well as its Renewable Energy Markets across North America. In 2019, Packard was named a Peter Kiewit Management Nominee – an honor given to only 150 people in 35 years. As an EMBA graduate, the sharp business acuity that Packard brings to the company has had a tremendous impact on the way corporate leadership perceives ROI in higher education. Many others in the organization were impressed by the results of his UNLV EMBA education. Packard recalls, “My direct supervisor said my business acumen expanded 10-fold and a client took the time to comment, ‘I saw you grow through your time at school.’” Closer to home, Packard’s wife chimed in commenting that she had never seen him so happy. But, beyond career advancement, it was intellectual curiosity that drove Packard to reach out for more knowledge and education. “I believe the body and the mind need to continue to grow through life,” he said. 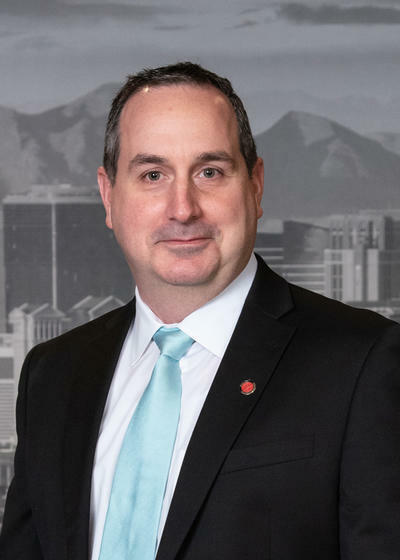 Packard considered EMBA programs at the University of Chicago and Vanderbilt, but it was his desire for a deeper connection to community that eventually made him select UNLV. “My office may be in Kansas City, but Las Vegas is my home,” said Packard.